This is a great dessert idea for the barbecue. Serve immediately with ice cream. Prepare the marinade of honey, cinnamon and tequila in a bowl and add the pineapple wedges. Allow to marinate for one hour before grilling. Preheat the barbecue or griddle pan to medium-high heat and lightly brush with oil. 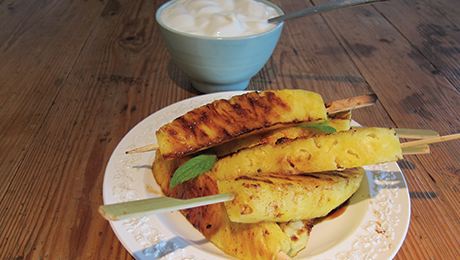 Thread the pineapple onto the skewers and place on an indirect heat on the grill until caramelised and heated through, approximately 3 to 5 minutes per side. Serve immediately with ice cream.